Immunoglobulin M (IgM), the largest pentameric immunoglobulin is used as a marker of recent primary infection for some diseases. IgM constitutes 5-10% of serum immunoglobulins in adults. IgM has half life of 5 days and can be produced in T independent manner. The immature B cell, called a pre-B cell, expresses only mIgM; later in maturation, mIgD appears and is coexpressed with IgM on the surface of mature B cells before they have been activated by antigen. A memory B cell can express mIgM, mIgG, mIgA, or mIgE. Monomeric IgM: Expressed as membrane bound antibody on B cells. Pentameric IgM: Pentameric IgM is secreted by plasma cells. Five monomer subunits are arranged with their Fc regions in the center and ten antigen binding sites on the periphery. The monomers are held together by the interconnection formed in Fc region by disulfide bonds and J (joining chain). J chain, which is added just before secretion of pentamer helps in the polymerization of the monomers. IgM is the earliest immunoglobulin to be synthesized by the fetus beginning by about 20 weeks of age. IgM can not cross the placenta. The presence of IgM in the fetus or newborn indicates intrauterine infection and its detection is useful in the diagnosis of congenital infections such as Toxoplasmosis, syphilis, rubella, cytomegalovirus infection and HIV infection. IgM is the first immunoglobulin class produced in a primary response to an antigen. IgM antibodies are relatively short lived, disappearing earlier than IgG. Presence of specific IgM against a pathogen in the serum of patients indicates recent/acute infection and helps in disease diagnosis. IgM ELISA test can be performed to detect such antibodies in the serum of patients. IgM has highest avidity of all immunoglobulins for antigens with multiple epitopes. Less IgM than IgG is required to neutralize viral infectivity. IgM is highly effective against viruses. IgM is a better agglutinin than other antibody isotypes. It takes 100 to 1000 times more molecules of IgG than of IgM to achieve the same level of agglutination. IgM is more efficient than IgG in activating classical pathway of complement. Complement activation requires two Fc regions in close proximity, and the pentameric nature of a single molecule of IgM fulfills this requirement. Monomeric IgM is the major antibody receptor on the surface of B lymphocytes for antigen recognition. Large Size: Because of its large size, IgM remains largely confined to bloodstream (80%). IgM does not diffuse well and therefore is found in very low concentration in the intercellular tissue fluids. IgM is believed to be responsible for protection against blood invasion by microorganisms. IgM deficiency is often associated with septicemias. High Molecular Weight: Because of its high molecular weight (900,000- 1000,000), it is often called macroglobulin and the ‘millionaire molecule’. 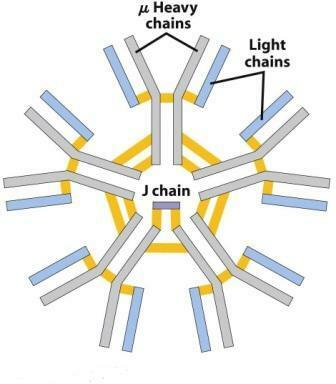 The presence of J chain allows IgM to bind to receptors on secretory cells, which transport it across epithelial linings to enter the external secretions that bathe mucosal surfaces. Although IgA is the major isotype found in these secretions, IgM plays an important accessory role as a secretory immunoglobulin. Thank you so much, but i have a question, how IgM is formed?